It all started with this. . .
My mother in-law is an amazing host. Every time she has a party she always has the cutest favors. This adorable tea cup was one of those favors. She found them at the DI, a thrift store. She grew some wheat grass in them, and had one at each place setting. 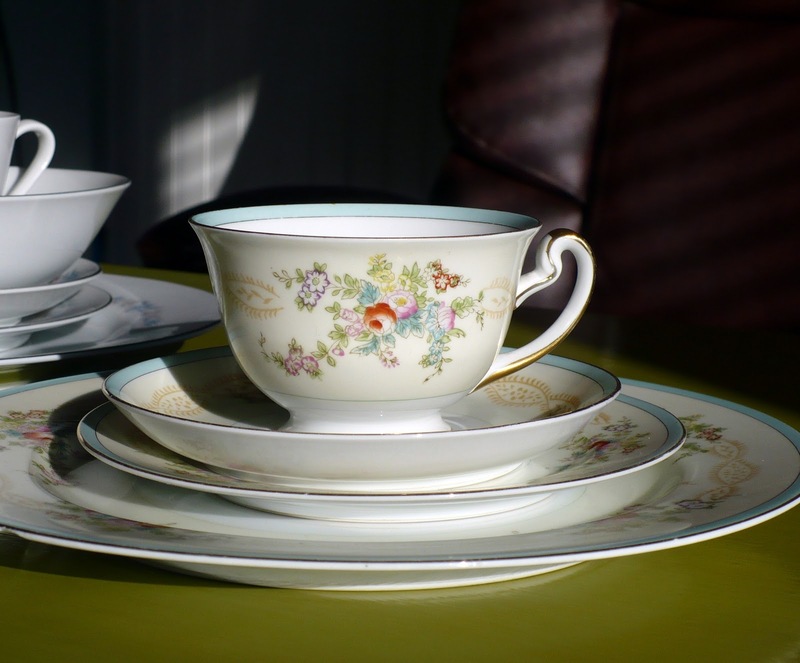 I immediately fell in love with the idea of having fine china. When I got married we didn't register for china (who knows why?!). 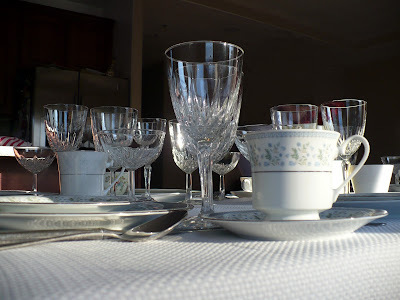 I mentioned to my mother in-law that I would love to start looking at thrift stores for fine china. I didn't want them to match at all, the more eclectic the better. This was in April, in December to my surprise and delight I opened my Christmas present from her and fell in love. 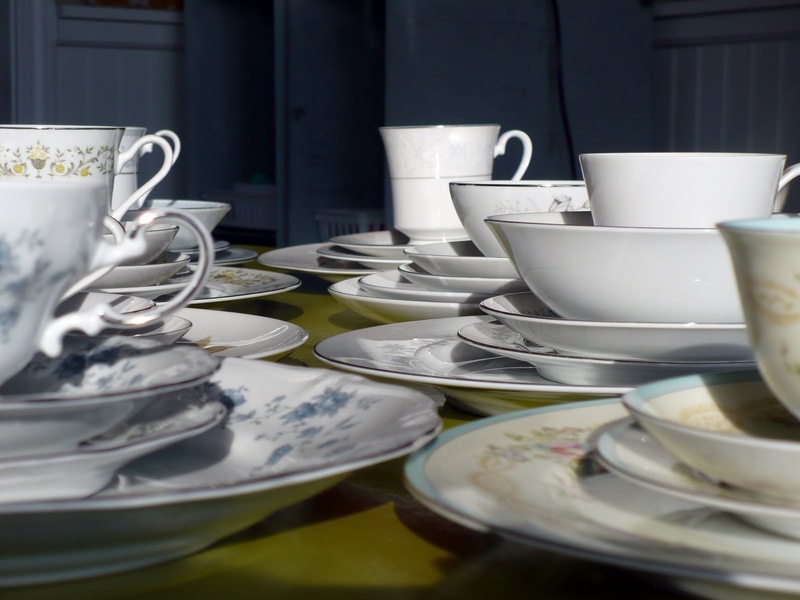 She spent 9 months combing thrift stores in search of fine china. I now had a place settings for 8. 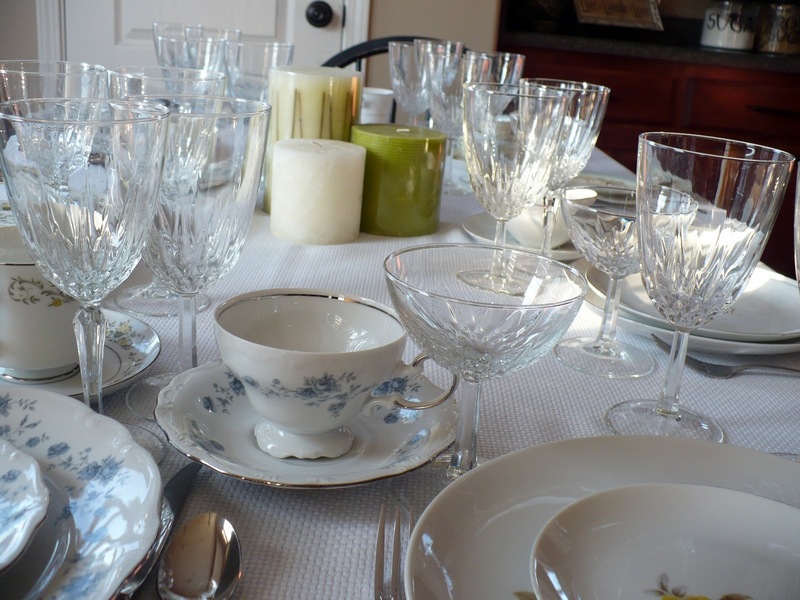 Each place setting has a matching dinner plate, salad plate, saucer and tea cup. Some of the sets even have a matching bowl, or an extra plate. Even though they match within each place setting, all of the settings are totally different. To top it off she also bought me 8 water goblets, 8 wine glasses, and 8 sherbet cups, all of which are real crystal. I couldn't believe she had done that for me! At the risk of sounding tacky, I asked her how much she ended up spending on the whole lot. I researched the china and found the price for each item if I had paid full price. I was able to find all of the patterns except one, if anyone knows what pattern this is I would LOVE to know!! For the main dinner plate she spent $1 on each one. For the other salad plates, bowls and dessert plates, she spent $.50 each. The saucers and tea cups were also each $.50. When you add this up it equals $22.50!! I couldn't believe it. 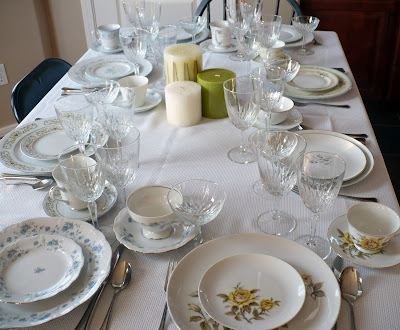 After all of my research, the estimated (due to the one mystery place setting) total is around $275. I wasn't able to identify the crystal glasses, but I did research how much it would be to buy a similar set. To average out the prices I am going to say around $10. This would mean that all of the crystal would cost around $240. My mother in-law paid $1 for the water goblets and $.50 for the wine glasses and sherbet cups. Add this all together and you get $16! Now I have a whole set of shabby chic dishes worth over $500 for less than $50! I am definitely going to keep building my collection. Even though it takes a lot of time and searching I think it is worth it, who wouldn't want these awesome dishes for that price! Wow! I love my mother-in-law, but I'm having a case of mother-in-law envy right now. Can you give some tips on what to look for at thrift stores? So pretty! I would LOVE to have a set like this too. I just have no idea where to start or where I would put it all once I had it! Love the character from all of the different combined china patterns. I notice assorted china at goodwill a lot, the teacups especially make me swoon, I have been considering using some to organize items on my desk. And wow, that's a great, thoughtful and time consuming to collect present! Erica, this is amazing! I love it! I didn't know the crystal was also thrift! How neat. She is an amazing woman. Mother in law envy coming from this direction also. my dh and i went on a trip and stopped at their warehouse this summer. 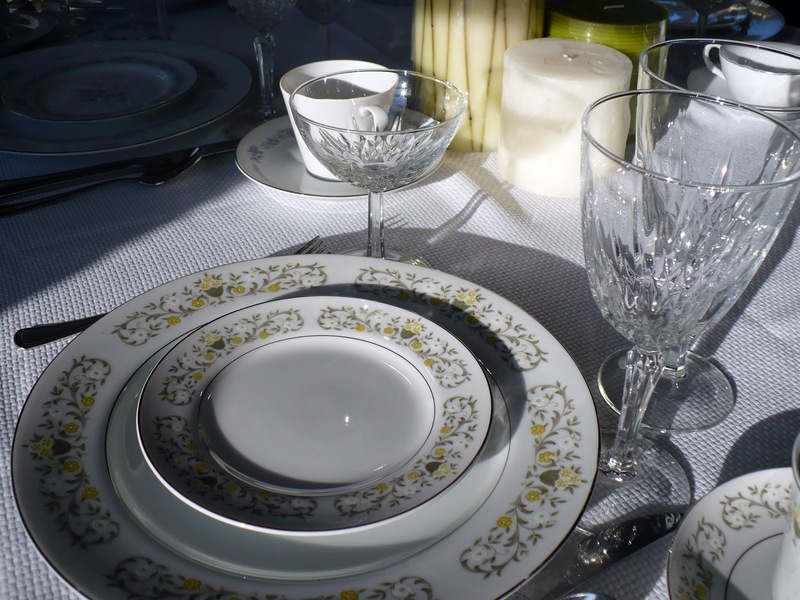 they have the largest collection of dish/glass/silver settings in the world and have a service where they will find specific pattern names, etc. for you. very cool! Awww, what a sweet mother-in-law! Gorgeous china! This is just a fabulous idea! I love how it looks. Keep that mother in law. She is cool. I love it. 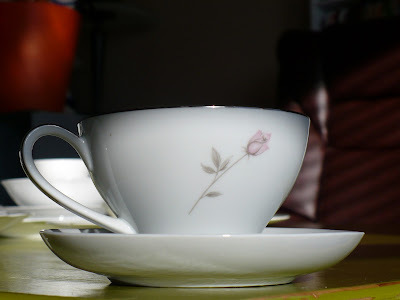 I have a collection of mismatched teacups and saucers that I've been collecting from garage sales. I love them! The first set you showed I have a set of 8 of this one that I use for my kids when they have friends over for tea parties. Your yellow rose set I have too. So fun! 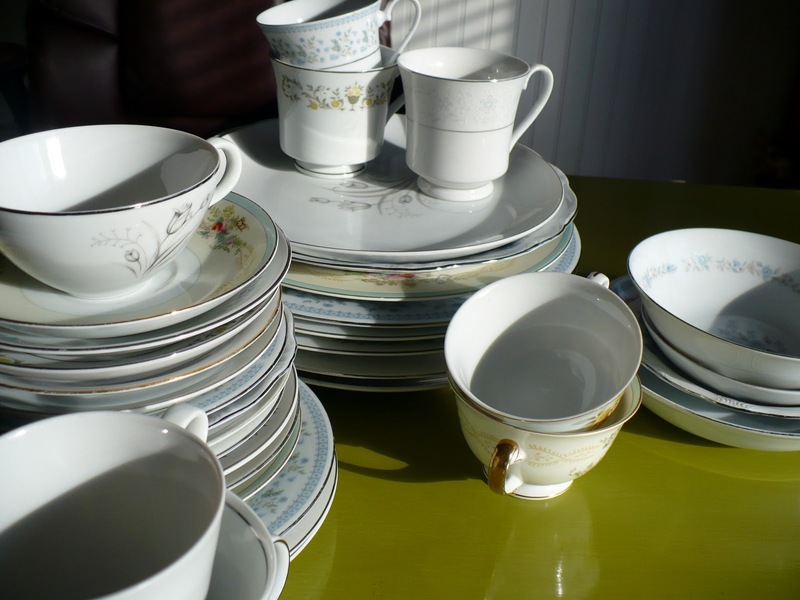 I have a whole plus set of mismatched china, have had it for years. I chose pink roses for my theme and bought pieces for it with pink roses on them. 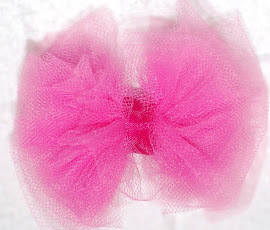 I used to use them all the time but have put them in my china closet and not done anything for awhile, I was even thinking of selling them but after reading this I think I am going to have a girlie party with my friends and one with all my daughters and daughter in laws and granddaughters. Looking forward to it! Thanks for the blog! Lovely tablescape! I could not decide which one I loved the most; all so pretty. Thank you for sharing. WHat a sweet MIL. Sounds like a keeper to me. You are so very fortunate, I had a GREAT MIL also, but she would never have thought of doing such a thing. Sure miss her. I have a feeling your unidentified place setting may be one of your most valuable. What a wonderful,thoughtful and really cool gift. Just the idea of it was so sweet. Makes me want to start a mismatched set. Thanks for sharing. Erica, you are one lucky girl!! 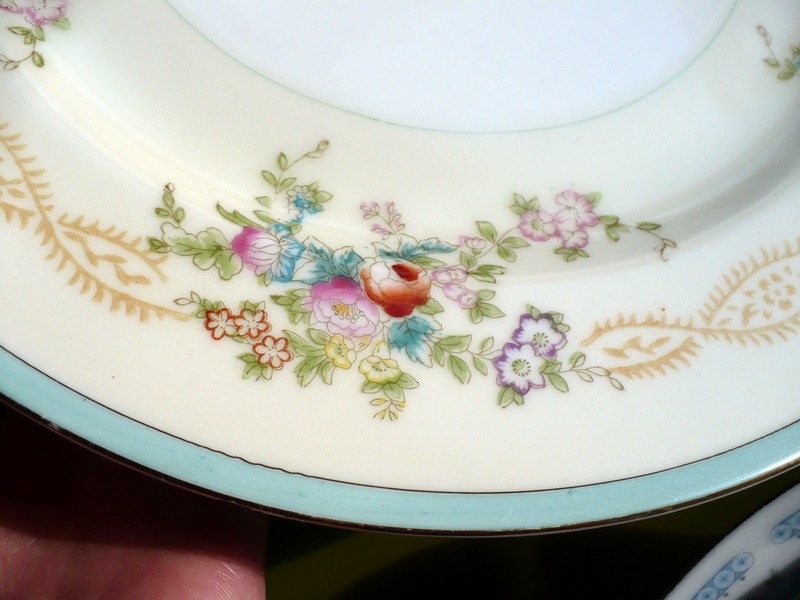 I look for china pieces now and then, but never see plates for that price. I tend to feel great if I spend $10 for a dinner plate. Keep that collection going! Looks gorgeous.